Freshmen state legislator Padma Kuppa is an assistant Democratic Whip in the Michigan statehouse. Michigan State Rep. Padma Kuppa was recently named an Assistant Democratic Whip in the state legislature. 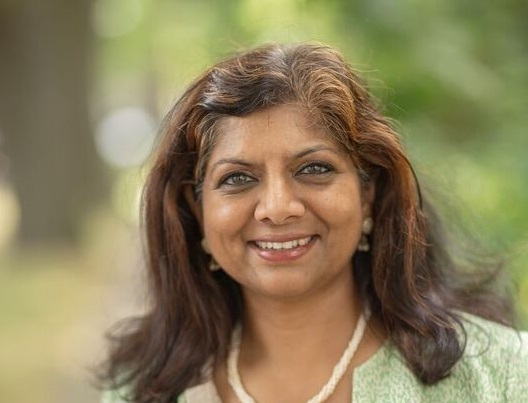 Kuppa, who was elected to the statehouse for the first time last November, is the first Indian American woman to serve in the Michigan state legislature. The lawmaker, who is extremely proud of her Indian roots, came to the United States as a 4-year-old, with her parents. She moved back to India as a teenager, but came to this country armed with an engineering degree and a greater resolve to make a difference in America. Kuppa talks to the American Bazaar about her new role and the significance of being an immigrant and a state representative. You have recently been named an Assistant Whip in Michigan, along with three of your Democratic colleagues. How significant is it for you? The role of assistant Democratic whip is to work with the Whip and other assistant whips to mobilize votes among the 52 Democratic Caucus members. I will have an opportunity to discuss policies with other representatives from across the state, and get to know what members are concerned about. It is an opportunity to build relationships with others to build a stronger Michigan. How important is the rise of Indian American women in country’s politics? We have an Indian American female presidential candidate now. What message does it send to the community? The increase of Indian Americans and women as elected office means that we have a more reflective, representative democracy. The ideals of democracy are also lifted up – that I, an immigrant, can become a State Representative. I believe that a diversity of viewpoints makes for better decisions. And when more people feel included in the democratic process, you have a stronger community. As an example, I just received a comment from a person in Dhanbad, India, on my Facebook page, “Feeling good to see you in the position.” People around the world can look to Michigan as a leader and a place where all voices matter. One of your missions as you stated has also been uniting people of different backgrounds. In current climate, how do you feel this can be implemented especially as the talks of a wall are at an all- time high? We need to be willing to talk to people across the political spectrum, to those who are different from us. Making connections with others across the state is very similar to what I have been doing – whether as the first female in mechanical engineering in college, or the first person of color on the City Planning Commission. Having an approach rooted in honesty and seeing the other as a friend is key. I am not afraid to speak with others about my perspective and my constituents’ needs. You have been critical of Education Secretary Betsey deVos’ policies. You also said that she devastated the state with her push towards privatization. Why was this disastrous and how do you plan to rectify it? We are not funding our schools adequately. The FundMISchools.org initiative involved teachers and provides a roadmap on how to rectify the current funding model. The Launch Michigan partnership of business, education, labor, philanthropy, and civic leaders is ready to take action on the many bipartisan studies showcase our challenges in Michigan. Our children’s education should provide them a path to a successful career whether they go to college or into trade. Numeracy and literacy are critical in today’s job market. The current for-profit charter school model is not successful – they are failing at rates equal to or greater than public schools. We need to fix public education as it is the backbone of our economy and our democracy. You are also very vocal about healthcare. What is it about affordable healthcare that the Indian Americans particularly need to know. How are they affected even if they are among the most affluent immigrant groups? Affordable healthcare is a sign of economic security and a strong community. People shouldn’t have to worry about being bankrupted by a health crisis. Healthcare should be affordable and people can send their kids to college without enormous debt loads. When all Americans have access to affordable healthcare, we are stronger as a nation.